I met you briefly the day after Christmas at Whole Foods on Sunday. I tried a sample of popcorn cooked in your oil. It was delicious. Although I didn't purchase your oil then I did find it again at Food Front and bought two bottles. I love cooking with your oil and wanted to thank you for making this product. It's healthy and delicious. I really enjoy cooking with it. I have used it to cook nearly everything including popcorn, chicken and even Brussels sprouts. Thank You so much for this wonderful note, You made my day! It really warms our heart to hear words like this, so glad you're enjoying cooking with our oil. 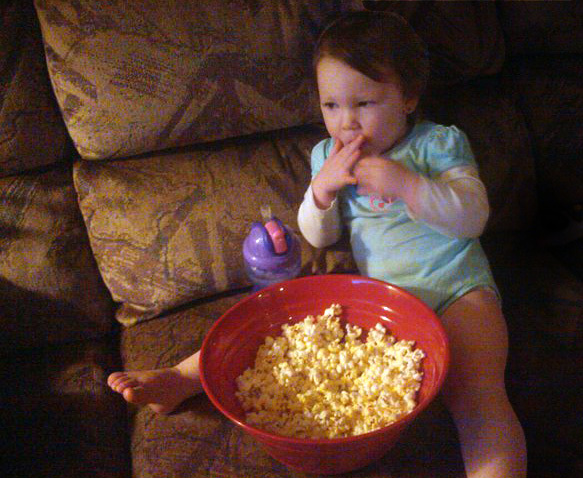 Our 13 Grand Children grew up eating popcorn cooked in our oil, This is our Great Granddaughter's testimonial! Kind Words from New Fans! We were rather rushed a few weeks ago when we met you in the Food Front Coop, but I wanted to let you know that we've been thoroughly enjoying the excellent PopSurprise spicy cooking oil that we bought from you! We've been putting it on all sorts of things. I really like it with a little basalmic vinegar for a simple but tasty salad dressing! thanks for the care that you've obviously put into developing your product. We were on LIVE TV! Anne was fabulous!!!! She knew her stuff! This is a great recipe for Mashed Potatoes with Olive Oil and Herbs from Giada on the Food Network. It's even better with our Spicy Cooking Oil in place of the olive oil! Use a covered pot of whatever size you want to make preferably Stainless Steel. With a handle you can shake it with while it is popping. A covered Wok is very good and requires little or no shaking while popping. Electric Poppers are nice; the best one I have found is the West Bend Stir-Crazy. Just put the oil and popping corn in the cooking tray, put the serving bowl / cover on, plug in the cord and watch it do its thing. When the popping stops unplug the wire, put the cover on the top of the bowl / cover, turn the whole thing upside down to remove the cooking unit from the serving bowl / cover, Salt to taste and enjoy. This is the amount of Oil to Popping corn I use to make about 6 qts. of popcorn. Popping corn: 6 oz, For other amounts use: 2 parts oil to 3 parts popping corn . Anything you need oil or butter to cook with, and want to add an exciting taste to, is where a little of our original Bold Spicy Cooking Oil will make a symphony of taste delight. Brush on, dip into or add to your favorite marinade for fish, beef, chicken, pork, wild game, egg plant, tofu, potatoes, bacon, sausage, and eggs. The list goes on. Use a little or a lot to suit your taste.